KOTA KINABALU (DEC 21, 2008): Malaysia’s Datuk Lee Chong Wei finally lived up to his top billing when he won the men’s singles at the Yonex Sunrise BWF World Super Series Masters Finals at Likas Sports Complex today. The world No.1, who entered the tournament with the dubious honour of never winning a tournament when he was the top seed, put an end to that hoodoo when he trounced Denmark’s Peter Gade 21-8, 21-16 in only 33 minutes. It was a grand day for Malaysia as the ended the world richest badminton tournament with three titles as Koo Kien Keat-Tan Boon Heong and Wong Pei Tty-Chin Eei Hui won the men’s and women’s doubles respectively. Chong Wei pocketed US$40,000 in prize money in the richest badminton tournament in the world that offered US$500,000 in cash prizes. Today’s win was his second straight game win over the Dane in the tournament. He had beaten Gade 21-19, 21-17 in a Group A match earlier in the week. Chong Wei said the final was surprisingly easy, especially the first game but the gritty Gade put up a stiffer resistance in the second game. The match took only 33 minutes. “I knew Peter would come back fighting in the second game after my easy win in the first. But I had prepared myself for a three-set game encounter but it did not materialise. “I am extremely happy and it is very satisfying to win my first title as a world number one. Now that I have broken the jinx, I am looking with confidence for the new season. “My target next year is the All England and the World championships. I will compete in the Malaysian Open next month but I will skip the Korean Open to give myself two months to prepare for the two important tournaments,” said Chong Wei. “After the Olympics I did not train much but still played in several tournaments. I skipped the Hong Kong Open to prepare myself for the Super Series Finals. Malaysia’s second title came when Kien Keat-Boon Heong finally won their first major of the year to end the 2008 season on a high. The Malaysians, who have been through a bad spell following their meteoric rise last year, were clearly delighted to have beaten South Korea’s Jung Jae Sung-Lee Yong Dae 21-18, 21-14 in only 37 minutes. “I’m extremely happy that we have finally won a major title this year. It has been frustrating but I think we are finally back on track and we can look forward to 2009 with great confidence,” said a relieved Kien Keat. “I think one reason for our re-emergence as a top pair is that we trust each other and play more as a combination instead as individuals. “We have also been very relaxed in this tournament. I have gone swimming, had walks on the beach and have just enjoyed playing without any pressure. Boon Heong echoed Kien Keat’s sentiments and also said he hopes this win will help them regain their status as the world’s top pair. Malaysia’s third title came when Pei Tty-Eei Hui outclassed Indonesia’s Vita Marissa-Liliyana Natsir 21-15, 22-20 in 34 minutes. “I am feeling very very tired but we are really happy to have ended the season on a high note. If China had been here we would still be ranked number one but the expectations would have been different. It has been a very good year for us. We will try to maintain our performance and achievements,” said Pei Tty. 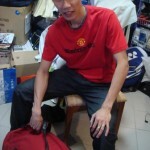 Eei Hui said: “I need to improve my physical fitness. I did not train much in the last two months after coming down with knee and ankle injuries. It was double heartbreak for Lilyana as she also lost the mixed doubles with Nova Widianto. The Indonesians squandered four match points against Denmark’s Thomas Laybourn-Kamilla Rytter Juhl and lost 21-19, 18-21, 22-20 in 62 minutes. “I was quite relaxed really. I didn’t feel any pressure as we had nothing to lose. We had given our best but I was determined to win the next point to regain the service as I was quite confident of getting a few more point to edge closer to the Indonesians. Hong Kong’s Zhou Mi gained revenge for her group loss to team mate Wang Chen (HKG 3) when she won the women’s singles finals of the Yonex Sunrise BWF World Super Series Masters Finals 21-14, 21-18 in only 32 minutes. Zhou Mi took home US$40,000 for her win. “The disappointment of not playing in the Olympics was there but I put that aside and looked to other tournaments as badminton is my first love,” said Zhou Mi. “My love for badminton is second to none. It kept me going and played in other tournaments some of which I won. That was satisfying. “I lost to Wang Chen in the group match but as I said earlier, I got adjusted to the local environment and my game improved. This was proven in my win in the final. The world number one was the top seed and the crowd’s favourite right from day one of the tournament which got underway on Thursday. Her top priority next year is the World Championships. “I have never won the world title and I will go for it,” added Zhou Mi who said she has some nagging injuries but she would rather not reveal to the public.